The Avian Influenza A(H7N9) continues its steady attrition. 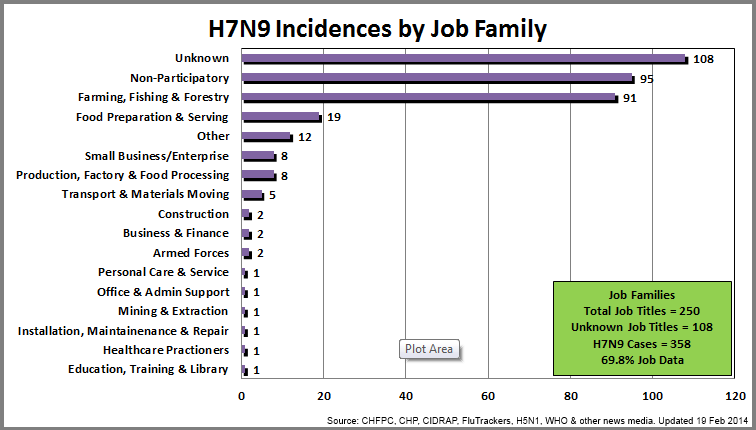 According to Flutrackers there have been 358-cases of H7N9. With Wave 1 (45) and Wave 2 (32) fatality counts as confirmed by Xinhua my unofficial fatality total stands at 77 (a Case Fatality Rate of 21.5%). While updating the most recent case details to my personal H7N9 Db today, a 29-year old female from Changsha, Hunan I noticed that we had reached an interesting milestone. Of the 358-cases thus far I have now been able to confirm 250 of their job titles. Let’s look at the data to data. Looking at the Job Titles we still find that the leading data item (occupation) is Farmer (35.6%), then Retired (24.4%) then the two paediatric titles of Primary School (5-12) and Child (0-4) with a combined total of 21 (8.4%). I’ve now been able to record 40 different titles with the top half accounting for 61.2% of the entire data, the bottom half just 8.6% and unknown 30.2%. When we role all the Job Titles into a Job Family the top-3 groups are Non-Participatory (26.5% comprising children, retirees and the unemployed), Farming, Fishing & Forestry (25.4%) and then Food Preparation & Serving (5.3% including catering, chef/cook, food sales, live poultry trade & market vendor). 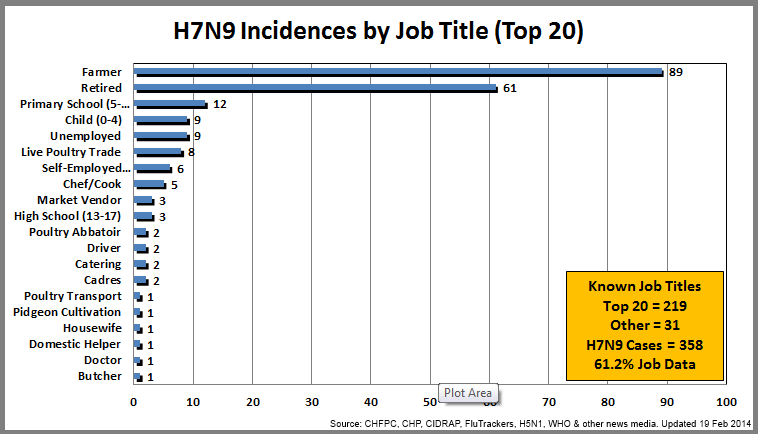 The average age of all H7N9 victims without a job title is 57. Last chart is a look at some main Job Titles in a running total. I’ve included child cases up to the age of 15-years in response to some of Ian M. Mackay’s concerns about an increasing paediatric count. Given that those unknown job titles cases have an average of 57-years I believe that Retirees are somewhat underreported but given the older age of Chinese farmers it’s hard to estimate a breakdown without some local knowledge (of which I don’t possess). 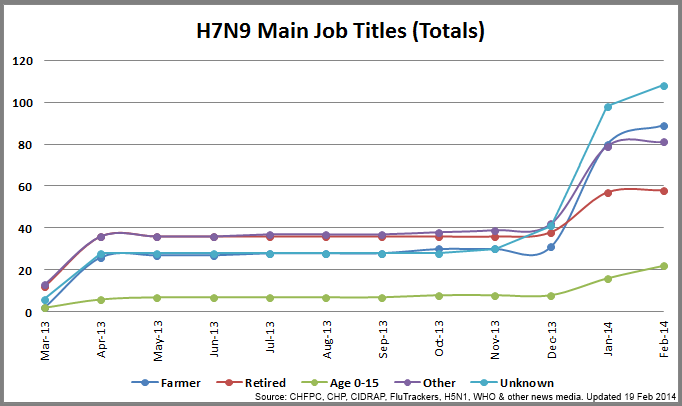 Without wishing for more H7N9 cases I’ll plan for another employment update as I confirm the first 300 Job Titles. There is a lot of interesting data in the first 250 Job Titles that I have been able to confirm. I only wish we had some more clarification on the almost 1/3rd of missing data items. I’ll continue to scrabble for information as it comes in. Public sourced journals with detailed case studies are excellent sources and I am sure we will be seeing some of the Wave 2 case studies in coming weeks and months.